For years, the best thing was the look on people’s faces when I handed over a painting. I get giddy on their shining eyes and compliments, thrilled that something I pour so much time and love into can bring them so much happiness. But now I am not sure! Last Spring, I had a stall at my local Village Fayre. I was there painting a Little Owl and selling my collection of cards, paintings and prints, when a lady asked me an interesting question. She said, referring to her nine year old daughter. I was caught off guard. I had never even thought of teaching. Being self-taught, I had no idea where I would begin. I don’t seem to create my paintings in a logical order – I flit from section to section, depending on what I fancy, or what paint I have on my brush. We swapped details and I mulled it over for a few days. Why not?! I thought. It would be fun! We agreed to start a series of six lessons in August. My boyfriend was being deployed, so it would be the perfect project to keep me busy and creative. Sophie (the nine year old) also seemed giddy with excitement. 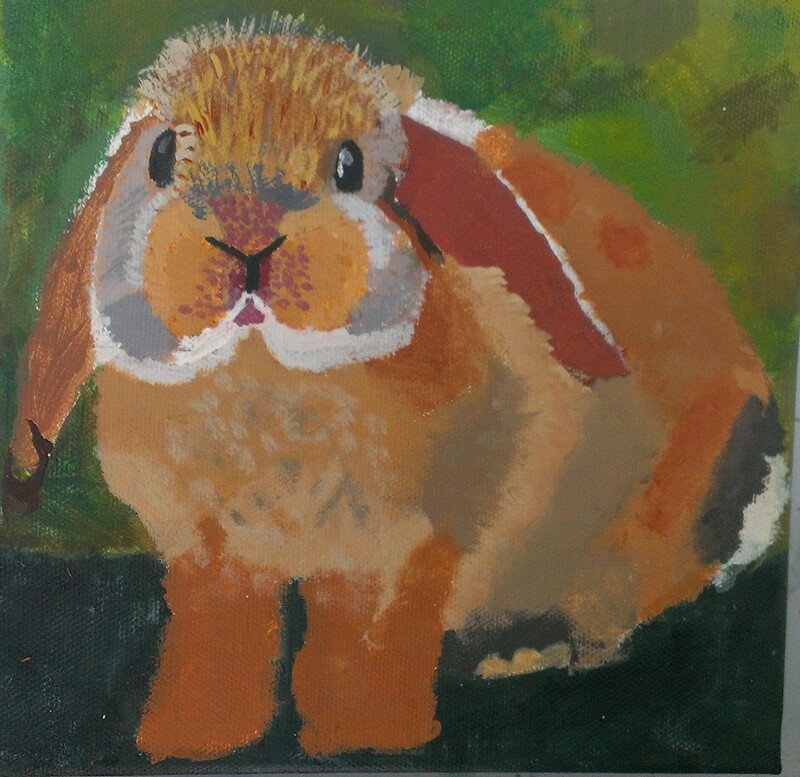 I went along, armed with a small box canvas, a bulging bag of paints and brushes, a ruler, a pencil and a gridded up photograph of a bunny. Not wanting to start off the lessons on a boring note, I explained to her that this step was by far the most important part of a realistic painting. Under my lead, she gridded up the canvas into five centremetre squares, and into each one, copied exactly what she saw in each square on the photograph. I taught her to really look at the photograph, and appreciate all the sections of shadow, light and contrasting colours, and mark them all onto the canvas. I promised that next week we could get our hands painty. We decided to do a green background full of vegetation. She was a bit timid at first, but with my encouragement, she started to mix colours and hesitantly dab them onto the canvas. I explained that the beauty of acrylic paint is that 1. If you made a mistake, you could paint over it and 2. That it was waterproof, so you could wipe off fresh layers of paint if they weren’t quite right. 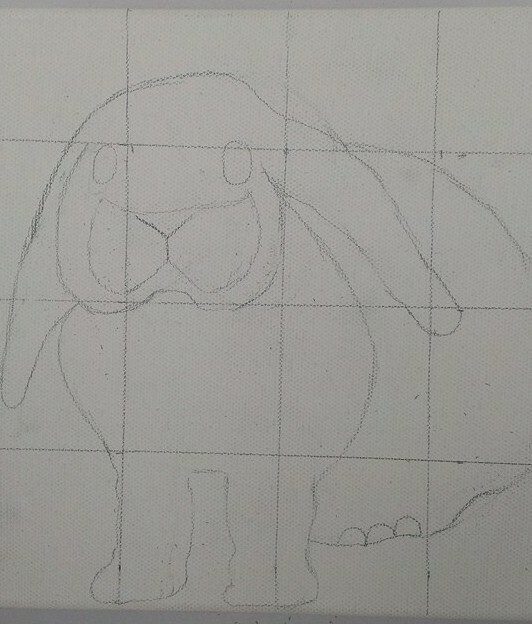 I outlined the importance of getting down base layers of paint on the bunny. Is my general rule of thumb. Together, we really looked at the photograph, and with my help, she was able to see subtle colours that you wouldn’t ever notice before. I said, pointing at the bunny’s pouchy cheeks. She mixed and dabbed colours, using different techniques and different brush sizes as required. I couldn’t stop myself from getting stuck in, subconsciously mixing colours, and applying paint to brushes, before catching myself and handing them onto her. This week, we were ready to get started on the bunny’s face. Together, we practiced painting eyes on a separate piece of paper. I showed her how to make them look 3D and alive, with a glint of light in them. We also practiced creating thin hairs with a little fine brush. After a few tries, she felt confident enough to have a go on the canvas. 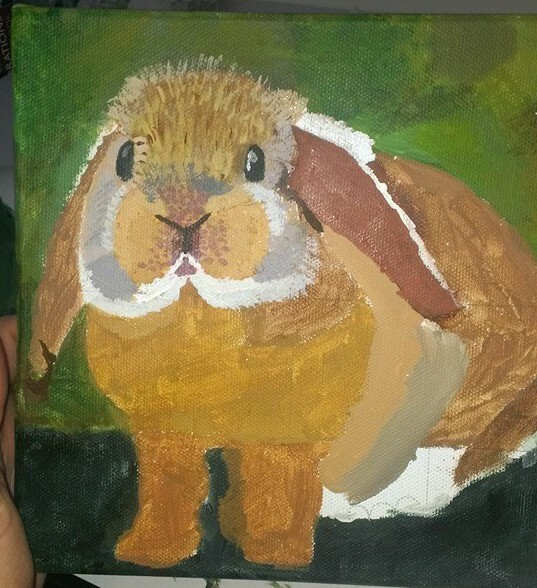 The result really started to bring the bunny to life. 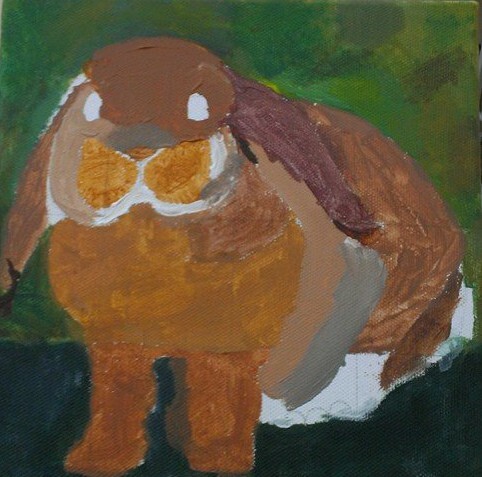 This week, we painted in the nose, mouth, and continued making the bunny fluffier, using different shades of colour applied in short sharp movements with a little fine brush. She said, anxious to take it into school and show off her work to her friends and teachers. We had such a productive lesson, and really got into the swing of getting our hands dirty for the sake of art. I noticed with joy how much more confident my student, and how much more control she had over a brush after only six hours of tutoring. She asked me how I made colours blend perfectly into each other in my paintings, and I admitted that the majority of the time, I use my hands! So that lesson, we did the same. In the final lesson, we practiced creating very thin lines using acrylic ink, so that we could create realistic whiskers. She said, unwilling to potentially ruin her precious artwork. I reminded her that acrylic paint is waterproof, and if she got it wrong, she could wipe it straight off! By the end of the lesson, she had marked on (and wiped off) dozens of whiskers, and painted on some grass around the bunny’s feet. I was overcome with pride at the finished result, at Sophie’s reaction, at her mum’s reaction! Her mum said to me. I can’t wait to do some more teaching! It feels so good to share my skills with others! 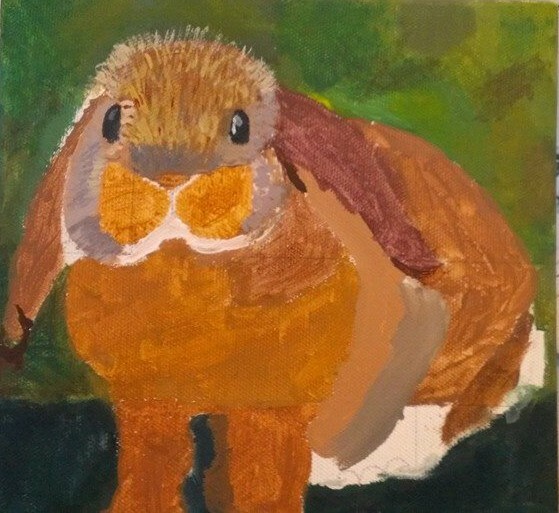 This entry was posted in Painting for pleasure, Reactions, Teaching and tagged animal artist, animals, art, art teacher Norfolk, art tutor ely, art tutor norfolk, artist farnham, children, childrens art tutor Cambridgeshire, creativity, happiness, painting, teaching by Animal Art by Imi. Bookmark the permalink. Hi Imi! So glad you discovered the joy of teaching — isn’t it great to share your passion and pass it on?! Teaching can be so rewarding.